Lymphediva creates fashionable and comfortable compression wear for women that are experiencing Lymphedema symptoms related to breast cancer. Available in three garment styles that are purchased separately, or together, based on each users different and unique needs. Choose from the compression Arm Sleeve, Gauntlet and Glove. 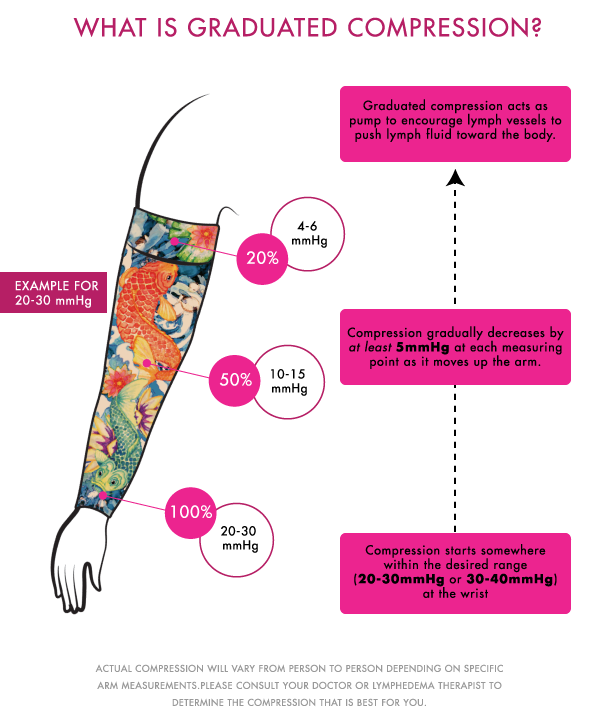 When worn, each compression component is intended to act as a pump that pushes lymphatic fluid toward the body. Each garment is designed with an Aloe Vera infused material to keep the skin soft and free of irritations. Lymphediva compression gear features moisture wicking material that works to keep the covered area cool and dry. Ultra-thin, 'fine knit' material is specifically designed to feel like a second skin, allowing for hours of comfort while the glove or sleeves are applied. Each Arm Sleeve, Gauntlet and Glove is available in a huge array of colors and patterns. Unlike many Lymphedema products currently available on the market, Lymphediva brand compression gear will allow you to display your unique style and individuality!